Our typical customer comes to us totally frustrated after trying three to five tack shop saddles that just don’t fit. 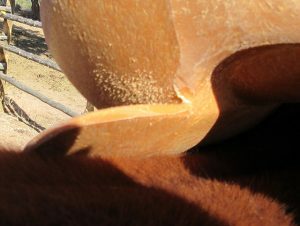 A saddle that bridges the horse or mule’s back with little or no contact in the middle is the most common problem we see. Most riders with only a couple of years’ experience have heard of bridging. The second most common problem we see is what we call a combination back. This is one not very many have heard of but we see it all the time. Tree matches starting width and angle. Let’s backtrack a little. The width of the tree is the first thing to consider when looking for a saddle that fits your horse or mule. This is how we pick a tree for a new build. The shape of the rib cage in the first two to three inches behind the shoulder blade will determine the width and angle of the tree. 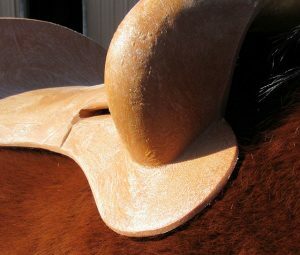 Tack shops usually stock saddles in narrow, medium and wide widths. So all you can do when you walk into a tack shop is find a saddle that matches the starting width of the rib cage. The rest of the bottom of the saddle is shaped on how the “average” narrow, medium or wide horse or mule is shaped. To make matters worse what is considered “average” varies from tree maker to tree maker. Two narrow trees from two different saddle companies could fit entirely differently. Over the years we have found that only about thirty to thirty-five percent of the horses we see would fall into that “average” range. Consider this: if ten men who are 6’ tall and weigh 180 lbs. walk into a JC Penny and take a suit of the rack, three or four of them “on average” would look fine. The other six or seven would have varying levels of success because they aren’t “average” enough. Two or three of them might even have to have a tailored suit custom made for them. Tree too narrow in back, it’s digging in. A problem arises when a horse has a combination back. He might need a narrow tree in the front but take a wide or extra-wide one in the back. You will never find a saddle at a tack shop like this. If you take that narrow saddle and put it on a narrow-wide combination animal, only the outside edge of the tree will make contact. The outside of the bar in the back of the tree digs in to the horse or mule’s back and concentrates the rider’s weight in a very small area. EQUImeasure to the rescue! When we pick a tree for a new build we take the EQUImeasure mold and use it to find the tree that best matches starting width and angle. Then, in the case of a combination back we will build up the inside of the tree and taper it to the outside to get contact across the entire bottom of the bar. As always maximum contact equals a happy horse or mule. Tobias and I now have about 25 miles with our new saddle which arrived just in time for Christmas. He used to move around a lot when I was tacking him up — and that’s over the course of over twelve years and five different saddles with three different saddle fitters. Tobias is an Appendix with high withers and a wide barrel, definitely a combination back. By the time I called C.J. I was at my wits end. Now Tobias stands to be saddled, is moving beautifully, and the hair on his back looks uniform afterwards. But I have said that before a couple months into a new saddle. Ask me again in six months, but so far so good! !